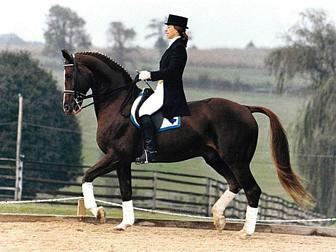 Dutch Warmblood horses are exceptional sport horses that have recently been prominent in the international equestrian. Some of the Dutch Warmblood superstars include Calypso, Next Milton, Big Ben, Ampere, Ommen, Zucarlos, Linky, Eastern Sunrise, Pascal, Ideaal and many more. Dutch Warmblood horses are sport horses that have evolved from Dutch Gelderlander and Groningen horses. Gelderlander horses come from the light sandy soils of central Holland; they are a stylish chestnut horse of medium stature. Groningen horses come from the heavy clay soils of northern Holland and are a large, heavy, black horse. In the heyday of coaching in the 19th century, horses were imported to Europe from England - the Norfolk Trotter, the Yorkshire Coach, the Cleveland Bay, the Hackney - to be crossed on the native mares, becoming the ancestors of the modern sport horses of today's foremost horse-breeding countries and regions. As horse use grew to include more farm work, the breeding goal changed. The farm horses had to be all-round horses honest and tractable enough for plowing, yet stylish enough for carriage use and for riding. As farm mechanization progressed after World War II, the breeding goal was redirected toward producing pleasure sport horses. During this process of ‘modernization’, there was again considerable foreign influence from France, England (Thoroughbreds), and Germany (Holsteiners and Trakehners).